I_ Assemble the torso as normal using polystyrene cement. Use a knife to trim away the psychic hood, leaving the rim at the height as shown. II_ Cut away any detail overhanging the edge of the chest plate. Follow the curve of the plate to guide you. III_ Carefully cut upwards from the bottom of the chest plate to remove the surface detail, as described in part I of this tutorial. As before, work gradually to ensure a relatively smooth finish. Follow the curve of the armour plate, and avoid cutting into the collar. IV_ To check you have shaped the piece properly, look at it from underneath. Here, you can see that the curve is not even, and that a layer of what was decoration remains in place. V_ Continue gradually shaving away layers until the chest plate is correctly shaped in a smooth curve or even depth. You should be able to see the collar, as shown. VI_ Trim away the belt detail on the back with one smooth cut. If you are careful, you can slip the blade in flat against the bottom and cut upwards without touching the surrounding area. VII_ Cut into the back of the torso, just to the side of the vent detail. Use the curve of the lower corner to help you get a straight line (see the following step for clarity). Press down carefully until the blade sits at the depth shown. VIII_ Remove the blade and cut back into the side as shown. IX_ This will cut away a square section from the back. X_ Make a guide cut near the top of the shoulder joint at forty-five degrees, as shown. Make this cut shallower than the one in step VIII – approximately half the depth. XI_ Cut in from the other side and trim away a triangular section. XII_ Round off the corner; either with a file or simply by making a series of additional and increasingly smaller angled cuts. XIII_ Repeat the process on the other side. XIV_ Trim away the remaining vent detail, aiming to get the back section as evenly flat as you can. The backpack will sit here eventually. 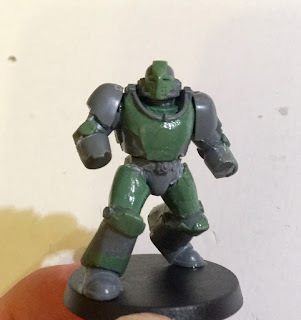 I_ Start by rolling a small ball of greenstuff, using the neck of your space marine head as a guide for size. Drop it into the recess in the torso. II_ Use the spoon-ended part of the modelling tool to press the ball down and fill the entire neck area as shown. III_ Fill any recessed surface detail on the front of the Grey Knight torso as described in steps XVIII and XIX of part 2. IV_ Roll a smaller ball of greenstuff – approximately three-quarters of the size of the one used in step I – and place it towards the back of the inside torso as shown. V_ Smooth the ball out with the same circling motions used earlier, to create the basis of the neck piece. It is important that this sits towards the back, against the collar, or your finished marine will look hunched forward, rather than throwing his chest out proudly. VI_ Make another similarly-sized ball and place it on top of the first. VII_ As before, smooth it out. This creates a simple internal collar. VIII_ Before the greenstuff cures, use a spare marine helmet to create an impression in the neck area. Push it down gently until it sits where you want the final head to be. IX_ Carefully remove the head to reveal a dip that will hold any standard marine head and give your true-scale marine more poseability when you are assembling him. If the greenstuff sticks or starts to come away with the neck, leave it to cure completely and simply remove the head later. I_ Place a sausage of greenstuff across the upper part of the torso, running from shoulder joint to shoulder joint. II_ Use your thumb or finger to secure it to the surface, being careful to keep it from spreading over the collar or onto the shoulder joints. Use the modelling tool to 'rein it in' or trim if necessary. Use this sticky surface to add a small ball – roughly half the size of that used in step I of the basic torso (above) – in the centre and press that down too. IV_ Use the flat and edge of the spoon-ended part to create a symmetrical shape with curves that lead towards the abdomen. Continue to refine the sculpting until you have a smooth finish as shown. I love this. And I wish I had the skill for it. Great tutorial. The True/Art scale marines I have built, and intend on building are for use as INQ28 Deathwatch (or traitors) so the specific marks are not as important to me, but diversity of armor types is. So maybe a tutorial on various sub-marks would be helpful, as I know you have made a ton of different types over the years. Lovely. Torsos were a major setback for me, I'll most definitely will try this way. Thank you for sharing! Thank you for starting such an excellent series describing your process into making your true scale marines! I feel over the years true scale marines have become pretty popular, and it always exciting to see each person's take on the concept, and how they approach the task. And while more and more people tend to "settle" with just combining some terminator parts, I have always appreciated how much green stuff work you do to really sell your vision of Space Marines. On a separate note, you where one of the people selected to win one of the Kings Men from our contest of Between the Bolter and Me last month! Please contact us, via our email address listed on the About Us section of the blog, so that we can determine where the model should be sent!